Good water management. A well-designed, professionally installed gutter and downspout system provides protection against erosion, plant damage and basement flooding. Gutters protect your house from a potentially devastating enemy: water. They direct excess water flow away from your home, protecting your foundation and walls. A gutter that is damaged or missing parts can lead to a variety of issues. Mold and mildew will be the least of your problems when cracks and leaks in the walls or floor freeze and expand, leading to warping, bowing, and staining. Luckily, Schoenherr Roofing can keep you high and dry with quality gutter installation and examination. We hang gutters and install gutter coverings throughout Colorado, and we won’t stop until you are completely satisfied with the outcome of your project. Don’t get caught in the rain! Schedule a free estimate for gutter installation in Lake Orion, Oxford Rochester Hill, Shelby Township and surrounding areas and keep your home safe from water damage. 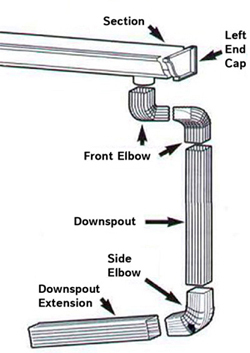 Here you can see how the parts of a gutter system work together to help protect your home from water damage. Well-installed gutters direct water away from your home, allowing your foundation and exterior walls to remain dry and water free. When properly hung, new gutters can contribute significantly to the updated look of your home and increase its value. Gutters protect your house year round from rain storms, snow storms, and even ice build up that may occur during cooler months. Gutters help prevent staining of the siding or paint on the exterior of your home by eliminating the splash down that occurs from runoff hitting the ground next to your house. Schoenher Roofing installs gutters gutters in Galvalume® coated steel, Copper or aluminum varieties. Each material provides a unique appearance and benefit, filling the needs of any application. This painted steel coil is coated with corrosion-resistant aluminum zinc alloy. This process combines the corrosion resistance of aluminum and the protection of zinc with the strength of steel. The resulting product is highly corrosion resistant and very durable. Homeowners choose copper over aluminum for its beauty. As copper ages, it develops into a newer, more beautiful patina. In the right hands, the custom copper gutter project can transform your not-so-important rain gutters into a piece of artistic genius. Aluminum is lighter than steel, corrosion resistant, and easy to work with, making it a popular choice for many homes. Aluminum gutters are available in a wider variety of colors than steel, making it easy for you to match your existing siding or paint. When you add a covering to your gutter, water can still flow freely off your roof and into the downspouts while trapping leaves and other debris. You won’t have to scoop all that gunk out of the gutters each year and enjoy a more functional gutter system. Schoenherr Roofing installs gutter coverings when we hang new gutters on your home. Gutters are available in standard 3”, 4” or 5” sizes. Downspouts can be rectangular, smooth round, or corrugated round. Rectangular downspouts are 2” x 3” or 3” x 4”, and the round downspouts are 3” or 4” in diameter. All of our professional gutter experts can handle the needs of your home, no matter how complex they might seem. Contact Schoenherr Roofing by calling 248-693-6100 or fill out the online form for a free inspection and estimate! We offer all our gutter services in Lake Orion, Macomb, Metamora, Oakland Township, Oxford, Rochester/hills, Romeo, Shelby township, Sterling Heights, Troy and throughout the surrounding areas.